A three-part selling skills training program, which provides a valuable introduction to the world of sales. This program has been designed for the novice salespeople with little to no sales experience through to seasoned salespeople. 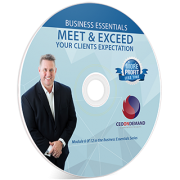 This is very much a hands-on series so participants will all have clear action plans and goals and the skills to execute them before its finished and is designed for owners and managers of micro, small and medium-sized businesses and their staff. Session will start at 8:00 AM sharp and finishes at 10:30 AM. NO RISK Guarantee: If you participate and don’t feel you got enough value from the workshop, we will refund your money in full and you can keep all the material. For more information, email admin@moreprofitlesstime.com or call at 03 9018 5699.